The last of my patches is queued up to land, so I figured I’d post an update about the performance improvements I’ve been working on. I’m also just excited about how well it has all come together. There were essentially 3 changes that mattered for performance on large trees. Fixing iter_entries_by_dir() to preload the data in Repository- optimal ordering rather than by-request ordering. In large trees this was causing us to thrash and become pathologically slow. In the 70,000-file test tree, thrashing took about 3 minutes, the preloading version takes about 15s. This affected a lot of our commands, though I guess the next two fixes would actually reduce the number of commands affected by this. This is the chart I put together for “whats-new-in-2.4.txt”. bzr-2.3.2 will have fix (1), but not (2) or (3), to give a feel for how much of an impact different fixes have had. So yes, some operations that were taking almost 5 minutes have now dropped down to taking <3s. You won’t see that dramatic of an improvement for smaller trees, though most cases will have a pleasant improvement. Here is a short list for the ‘Launchpad‘ tree (with ~8k items). 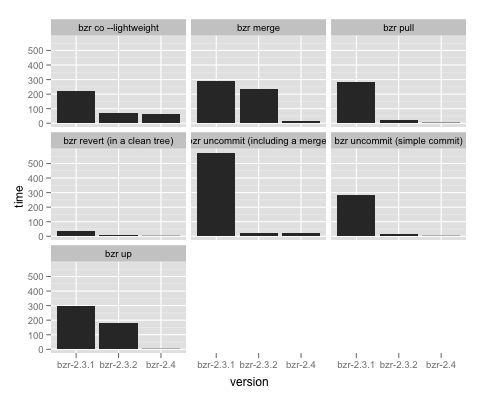 Anyway, I’m quite happy about how much better bzr-2.4 will be in large trees.